Lovely ‘g’ in a functional garage sign, stencilled or hand-painted? Standard hand-painted commercial ad to look like a printed ad using script typeface, to look hand-written… or am I reading too much into this? Hand lettered shop sign in a formal style. I’ve posted these after reading the section on ‘vernacular typography’. I could just have easily chosen a similar set from Stockport Road in Levenshulme, in South Manchester > except that I don’t have the electronic copies to hand. The point about these is that somebody’s painted them, so they have some personality in them. Even the full-shop front painted ads – which are really common in Northern Kenya, especially for mobile phone companies – have to fit around the individual shape of the shops. Mobile phone company full shop front ads would be a good topic for documentation here I think. Following on the waymarking issue, this is a rough set of directional arrow signs to make it clear where a path is, and who can use it. 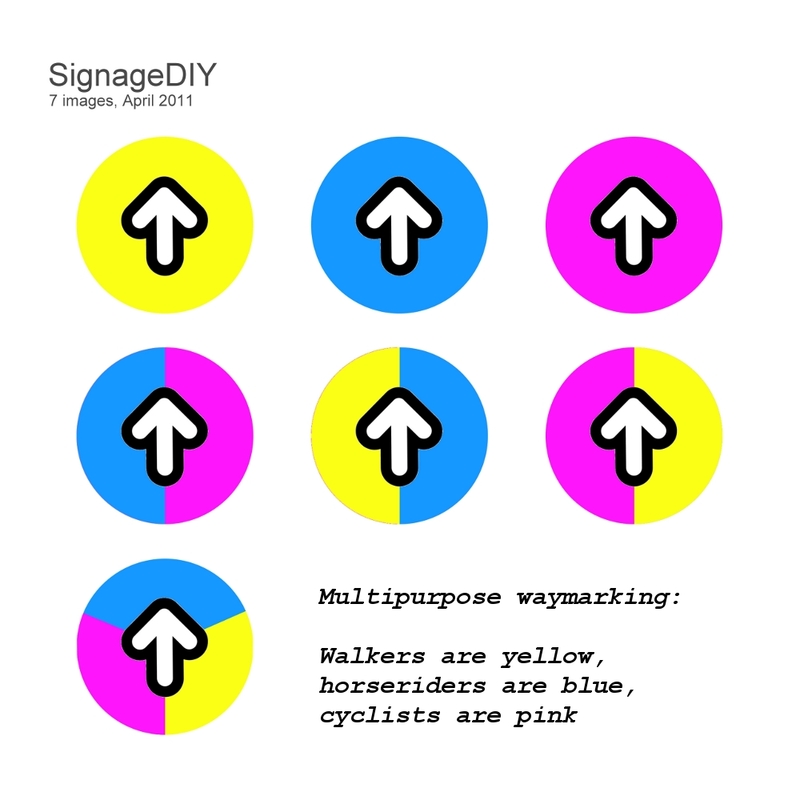 They’re designed to be pinned onto gates and posts etc, as an alternative to yellow arrows. The arrow is the main feature and the sign can be pinned on at the appropriate angle so it points in the direction of the path. The colour coding is secondary, and also helps the sign to be visible. This is intended to be primary signage, to show where to go, any other signage can be added on underneath! Whatever materials were used would obviously have to be colour-fast and weather and vandal-proof. Pink is chosen as the colour to represent cyclists – as a strident colour it’s presence should warn the calmer categories that they are at risk of being flattened by mountain bikers. Yellow and blue follow the existing colour coding for walkers and riders, for the sake of continuity. Movement as in directional movement ie going from one place to another; waymarking (here are the roads and paths); controlled and permitted movement ie. you will go this way (or not). Ampelmannchen and Karl Peglau’s traffic lights – snippet from Wikipedia. The Ampelmannchen was the symbolic person shown on traffic lights at pedestrian crossings in the former German Democratic Republic (GDR – East Germany). The Ampelmännchen is a beloved symbol in Eastern Germany, “enjoy[ing] the privileged status of being one of the few features of communist East Germany to have survived the end of the Iron Curtain with his popularity unscathed.” After the fall of the Berlin Wall, the Ampelmännchen acquired cult status and became a popular souvenir item in the tourism business. Is this true? Also on German traffic control… the traffic lights on the left were designed so that they could easily be seen by people who were (red-green) colourblind. However, they were never put into production because they were too expensive. 21st century British leisure culture. It’s quite hard finding any directional signage in the UK that doesn’t include an arrow somewhere – either as part of the outline shape of the arms on old road signs or as symbols attached to the directional information, or just an arrow on its own. I think this is how it is supposed to work at the moment… Casual footpath signage is in the process of evolving from primary colour-coded spots or blobs to uniform arrows – the lead colour is currently yellow for footpaths (visible, national uniform identity), sometimes white (cheap, practical) or green (nature, forestry, healthy living). Bridleways are blue (?open skies?). National trails are also branded with acorn symbols, and there is a whole subculture of lesser more localised trails with their own branding, some of which is quite complicated – for example the Jack Mytton Way is one I came across and puzzled over for 3 days until I got to the page in the book that explained it – and of course my image of the person, based on the sign, was way off the reality by then. 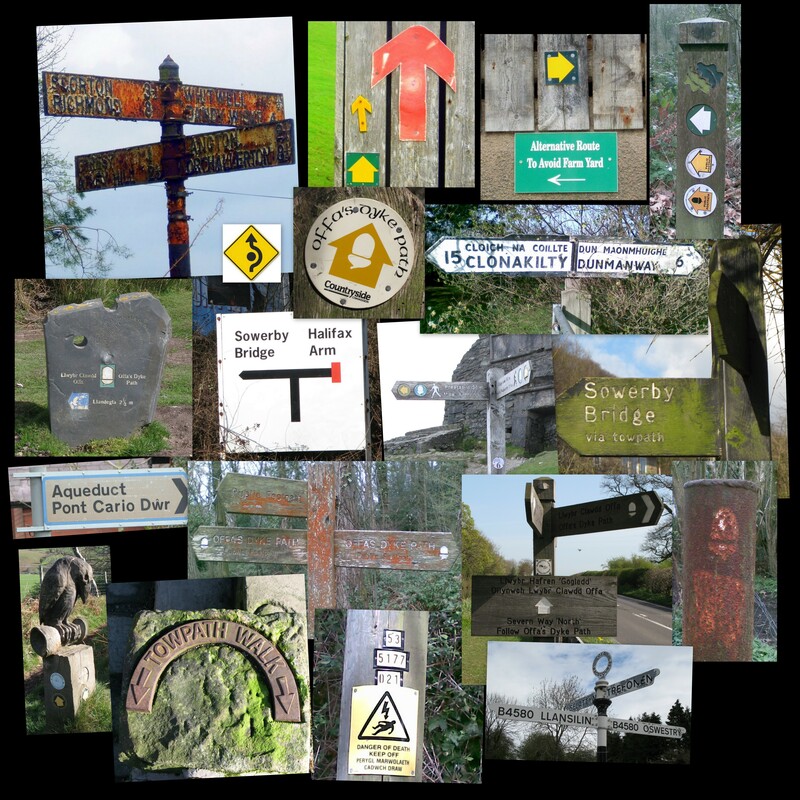 Some sections of footpath have many names where several trails use the same path, and some fields have many differently named footpaths criss-crossing them in all directions – and so some signposts carry a whole array of arrows and symbols and logos. On the collage above note another use of directional arrow (deadly electricity), on the ‘danger of death’ sign – most of these seem to be yellow when you’ld expect them to be red. Also I’ve included a neat directional yellow roadsign depicting an arrow moving around a static object. If I've included any images on this blog that are in breach of anyone's copyright, it's not intentional, so please get in touch and I can remove them. Erik Spiekermann on how typography is used in the digital domain – convergence with nice socks. HandpaintedType – documenting the typefaces of road side painters across India. Unicode 5.0 encodes exactly 98,884 graphic characters on different planes. V6 is on it's way.